Distribution and habitat: Beaucarnea Recurvata is native to the dry regions of Texas and Mexico. It is an evergreen perennial growing up to 6m (20 feet) with a noticeable expanded caudex, for the purpose of storing water, this plant being able to store a year-long water supply in its bulbous trunk. The single palm-like stem produces terminal tufts of strap-shaped, recurved leathery leaves with occasional panicles of small white flowers. Description: Mature plants develop an unusual, swollen, bottle-like base (the storage organ that allows them to withstand very dry conditions) with several long, thin stems. The stems are topped by the crowns of pendulous strap-like leaves which give the plant one of its common names – the Ponytail Plant. The plant is also referred to as the Elephant Foot Tree because of the swollen shape base, coupled with the greyish-brown colour and the wrinkled texture of the bark. Beaucarnea Recurvata is the most commonly grown of the Beaucarnea species. It is a slow-growing plant with a green rosette of recurved, pendulous leaves rising from its swollen trunk. Indoors specimens obviously will not develop the same tall, tree-like streams as plants grown outdoors. When grown as indoor plant the concave green leaves which can be 2m (7 feet) or more long in the wild, are unlikely to exceed about 70cm (28 inch) in length. Clusters of small, whitish, insignificant flowers are borne on short stalks in spring, through they are unlikely to appear on indoor plants. Houseplant care: Beaucarnea Recurvata is basically a “plant it and forget it” kind of plant, providing it has enough light to thrive and somewhat steady water throughout the growing season. As with all palms, ponytail palms should never be top-trimmed. Plants moved from indoors to permanent outside locations should be gradually exposed to the increase in light and temperature change. Keep in mind, though, that Beaucarnea Recurvata is an extremely slow-growing plant, so don’t expect your desktop plant to transform into a corner specimen in one or two growing seasons. Light: Beaucarnea Recurvata should be provided with bright light at all times, preferably with some direct sunlight. These plants will grow much more slowly if insufficient light is provided. Temperature: Normal room temperature, however variable, should be suitable at all times. The ideal temperature range for active growth period is between 10°C (50°F) and 24°C (75°F) and for the rest period between 4°C (39°F) and 18°C (64°F), but these hardy plants are quite tolerant of extremes and frequently thrive in conditions which are quite unsuitable for other plants. Water: Water Beaucarnea Recurvata quite sparingly. During the active growth period allow the top few centimeters (one inch) of the potting mixture to dry out completely before watering again. During the rest period allow almost the entire mixture to dry out before watering. Fertiliser: Very little extra feeding is necessary. However, the Beaucarnea Recurvata will benefit from weak applications of a complete fertiliser about once every two weeks during the active growth period. 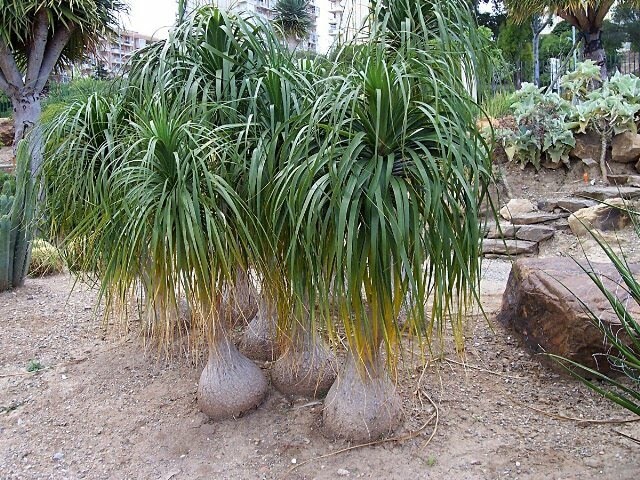 Potting and repotting: Because of the weight of the trunk and leaves, Beaucarnea Recurvata may become slightly top-heavy and fall over, so it is best to use a soil-based potting mixture and a heavy pot. Indoors, these novel little palms are often grown in shallow pots. These plants seldom need repotting and seem to respond quite well to being pot-bound. Move them on to a larger pot size in spring only if they appear to have completely outgrown their current container. Otherwise, it should be sufficient simply to provide some top-dressing with fresh potting mixture. Propagation: Propagation of these plants is by seed. The process is long and likely to prove tedious for the average gardener. Well-grown plants are normally available from plant suppliers. Uses: Beaucarnea Recurvata is often grown as a houseplant or outdoor plant in temperate climate gardens. It is hardy to −5 °C (23 °F), and grows in full sun to light shade. It is very slow-growing and drought-tolerant. Outdoors, Beaucarnea Recurvata can be used as container plant to a patio or north-facing verandah or into the open garden. It is a good container plant for warm, well lit positions indoors as well as on balconies, around pools and courtyards in warmer areas. Often grown as a street tree in tropical climates. 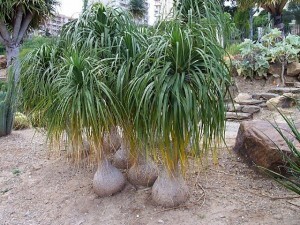 Beaucarnea Recurvata is drought-tolerant, suitable for xeriscaping. They are ideal plants to use for rock gardens because they like, warm, dry climates. Beaucarnea Recurvata is an excellent choice for home or office. Beaucarnea Recurvata plants make great indoor Bonsais and are ideal for beginners. Problems: Beaucarnea Recurvata is usually not affected by insects. However, when growing it indoors watch for spider mites and mealy bugs. Treatment: Rinse away a minor attack. Completely wash both sides of each individual leaf with a cloth or sponge dipped in soapy water. If this does not help then use miticide at recommended intervals. Root rots can kill plants grown on wet soils. Treatment: Do not overwater the Beaucarnea Recurvata. During the winter season, cut back water to monthly.